"America's public enemy number one in the United States is drug abuse. In order to fight and defeat this enemy, it is necessary to wage a new, all-out offensive." ent from its original intent. Rehabs.com recently launched a study, "Drug Bless America," to explore the issue. In April of this year, the Government Accountability Office had harsh words for the White House's Office of National Drug Control Policy: "ONDCP has developed a five-year Strategy to reduce illicit drug use and its consequences, but our analysis shows lack of progress toward achieving four of the Strategy's five goals for which primary data are available." Despite aggressive policies and enforcement actions against every link in the chain of producers, distributors and users, the illicit trade has become more prolific than ever, exacting a painful toll on every area of society it touches. Rather than defeating our "public enemy number one", this offensive appears to have largely failed to prevent the global drug epidemic from spiraling out of control. The war on drugs has received over $1 trillion in funding since its inception. During that time, the population of Americans incarcerated for drug offenses has skyrocketed from 40,000 in 1980, to 500,000 today. 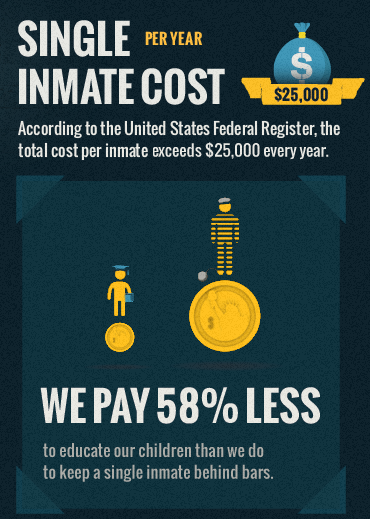 The government now spends around $12.6 billion a year to house and care for these hundreds of thousands of inmates -- a cost of $25,251 per person according to the Federal Register. Compared to the $10,591 spent to provide public education to a single student, our investment in prosecuting the drug war vastly exceeds our investment in the future of our children. Yet were it not for the massive costs and still-growing prison population, one could be forgiven for thinking the drug war had never taken place at all. Around the world, 450 tons of heroin are trafficked yearly, sourced from sprawling poppy fields in Afghanistan and Myanmar. The size of this market exceeds $55 billion - greater than the GDP of several European nations. A mere 81 tons of this global supply was seized in 2008, while the rest continued unhindered to its end users. In the United States, 22 tons are consumed yearly - two-thirds the weight of a Boeing 737 jet. However, the heroin epidemic is still dwarfed by the scale of the cocaine market. With a total value of $88 billion, 865 tons of cocaine were produced worldwide in 2008. The United States is a world leader in cocaine use, consuming 165 tons -- the weight of a blue whale. Just one pound provides 13,000 doses of the drug. 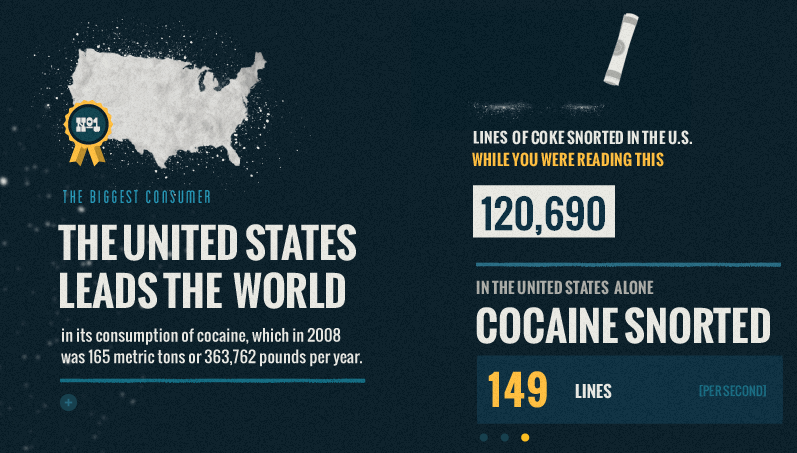 Cocaine is used billions of times every year in America. The U.S. accounts for a substantial fraction of the 230,000,000 drug users around the world who drive the demand for these illicit substances. If these customers constituted a nation, it would be the fifth most populous in the world, exceeded in size only by the U.S., China, India, and Indonesia. The human toll of this drug epidemic has been extraordinary: in 2009, drug use was responsible for the deaths of over 37,000 people in the United States -- exceeding the number of traffic fatalities for that year. Over the past decade, the number of deaths due to drugs has doubled, as other causes of death have declined. These deaths occur every 14 minutes in our country. In Los Angeles County alone, over 800 drug-related deaths occurred each year from 2000 to 2009. The financial and economic drain of a drug habit is substantial. A heroin user who spends $50 a day on the drug could save $180,000 over a decade, were it not for their addiction. And cocaine abusers with a $75-a-day habit would save $250,000 over ten years. This money, which could have been reinvested in the economy, instead enters the illegal drug market and funds drug production and distribution operations on a massive scale. The impact of the drug trade extends far beyond substance abusers themselves. The illicit nature of the trade has left it inextricably entwined with crime and violence, ensuring that these activities largely take place in a lawless realm where anything goes. Most of the American cocaine supply originates in South America, traveling through Central America until it reaches the U.S.-Mexican border. These shipping routes are a site of shocking, almost unimaginable violence. In the Mexican city of Ciudad Juarez, adjacent to El Paso, Texas and home to the Juarez drug cartel, over 3,000 murders occurred in 2010 among a population of 1.5 million - far exceeding any city in the United States. Juarez has been described as "one of the most murderous cities in the world" and "the most violent zone in the world outside of declared war zones." The effect of this violence on the citizens of Juarez goes beyond anything experienced in America. The Juarez cartel, controllers of a substantial amount of U.S.-Mexico cocaine traffic, have embarked on a bloody campaign to instill fear in any who would oppose them. Well-known for decapitating their victims and dumping mutilated bodies in public, this cartel is prepared to target anyone: other cartels, police officers, and innocent members of the public. Their enforcement arm, La Linea, has attacked and killed dozens of people at rehab clinics and children's birthday parties, and their targeting of officers has frightened many into quitting the force, or joining the cartels. Their campaigns of car bombings have been compared to terrorist and urban warfare tactics seen in the Middle East. These acts of intimidation are conducted by gangs comprised of former policemen, as well as over 150,000 former members of the Mexican armed forces. The residents of Juarez are afraid to leave their homes at night, because of the cartels' efforts to ensure that the supply of cocaine continues to reach the U.S. unhindered. This is the violence driven by our country's endless hunger for drugs. Even worse, users' demand for narcotics does not change even in the face of overwhelming penalties and efforts at prosecution: attempts to stem the tide of drugs have simply caused street prices to increase, providing even greater funding to these gangs as addicts pay ever more to satisfy their habit. As an economics textbook explained: "It's hard to beat an enemy that gets stronger the more you strike against him or her." And after 40 years, a trillion dollars, and thousands incarcerated or dead due to illicit drugs, the nation's narcotic epidemic appears to have no end in sight.